With many options to consider when purchasing a pre-owned jet, it is critical our clients decide on the aircraft model that best suits their needs. In some cases, modifying or refurbishing an aircraft will be desired. The team at Essex assists clients in evaluating all the various aircraft options based on their specific needs and desires. 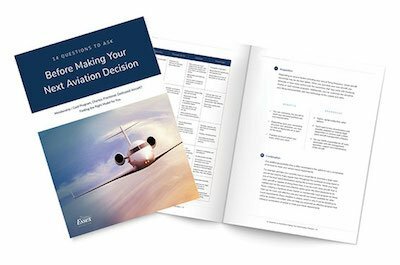 Essex also provides an operational and financial analysis to ensure the most appropriate aircraft and aviation utilization models and applications are considered. Once the initial evaluation is complete, Essex reviews the market to identify potential aircraft that meet the criteria outlined in phase one (above). Upon identifying the aircraft, Essex manages the entire pre-purchase inspection and technical acceptance process as well as final closing and transfer of title, with on-site support and representation if desired by the client. In some cases, this pre-purchase event aligns with an opportunity for new equipment installations and improvements, which can begin as soon as the transaction closes. Do You Need Refurbishment Consulting? Essex’s clients receive thorough consultative services that cover every aspect of pre-owned aircraft ownership.